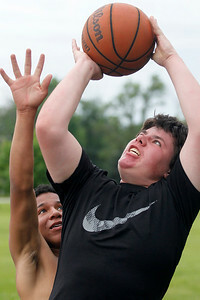 Matthew Apgar - mapgar@shawmedia.com Chris Guzman, 15, left, tries to block a shot by Justin McMullen, 16, both of Marengo, during a pickup game of basketball on Wednesday, June 24, 2015 at Renwick Park in Marengo. 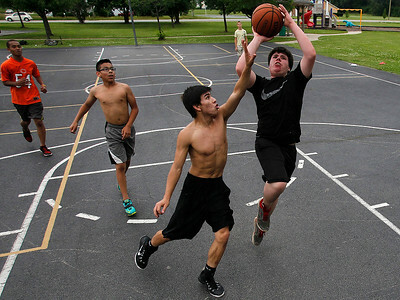 Matthew Apgar - mapgar@shawmedia.com From left: Floyd Benson, 16, Nikolas San Miguel, 13, Matthew San Mighel, 15, and Justin McMullen, 16, all of Marengo, play a pickup game of basketball on Wednesday, June 24, 2015 at Renwick Park in Marengo. 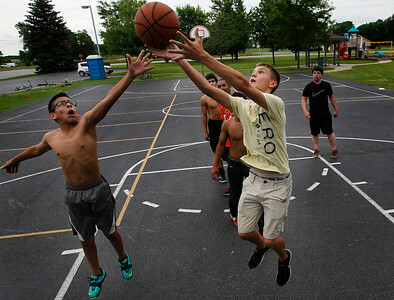 Matthew Apgar - mapgar@shawmedia.com Nikolas San Miguel of Marengo, 13, left, and Travis Knaak of Union, 14, right, jump up for a rebound during a pickup game of basketball on Wednesday, June 24, 2015 at Renwick Park in Marengo. Matthew Apgar - mapgar@shawmedia.com Matthew San Miguel of Marengo, 15, delivers a layup to the hoop during a pickup game of basketball on Wednesday, June 24, 2015 at Renwick Park in Marengo. Matthew San Miguel of Marengo, 15, delivers a layup to the hoop during a pickup game of basketball on Wednesday, June 24, 2015 at Renwick Park in Marengo.